Gornje (Upper) Zilje is named with reference not so much to elevation, but to direction of flow of the river Kolpa (it flows from Upper to Lower Zilje). This is the part of Zilje that is closest to Vinica, and this is evident in the local vernacular when compared to the language of Lower Zilje, which has more influence from Preloka. Gornje Zilje can further be divided into Gorenjci (in the West, along the old road), the hill known as the Majišče (to the North), and Muretičevo selo (to the East). The remainder of Gornje Zilje lies between these subdivisions, and we have called it Central Gornje Zilje, although this is only a descriptor. The part of the new road that traverses Gornje Zilje (we can see it paved in the satellite image) was constructed before World War II. The old road entered Zilje in the west at the Šoštari in Gorenjci, passing the Ivičini and Stegneti, then followed the current route all the way to the Dolnji Brožiči. From this point it veered slightly north and passed between the Moravci and Brdari. 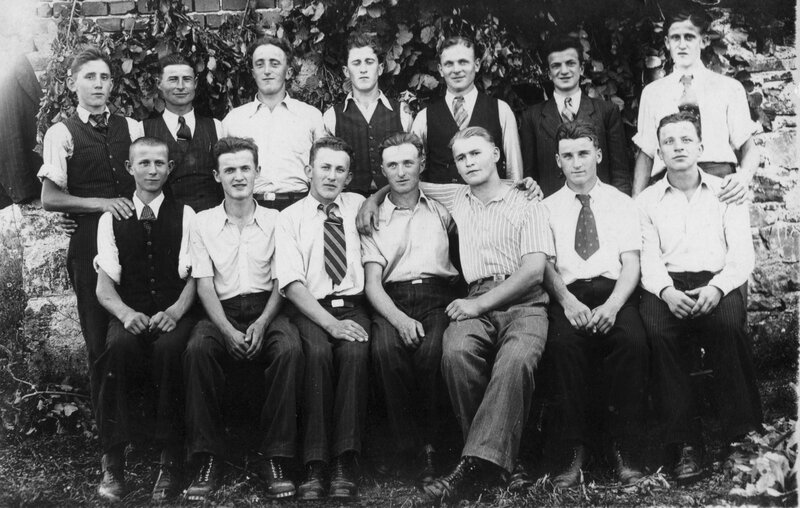 Standing fromt he left: Ivan Čadonič (Ivičin), Mihat Grabrijan (Pintarov), Janez Stegne (Dolnji Lugarov), Jože Čadonič (Ivičin), Mika Čemas (Peričin), Peter Čemas (Peričin), Jure Čadonič (Ivičin). 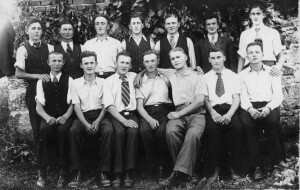 Seated from the left: Peter Grabrijan (Pintarov), Peter Starešinič (Špeličev), Peter Balkovec (Maradinov) from Srednje Zilje, Franc Stegne (Dolnji Lugarov), Franc Starešinič (Špeličev), Slavko Starešinič (Pemski), Mika Čadonič (Stegneč).